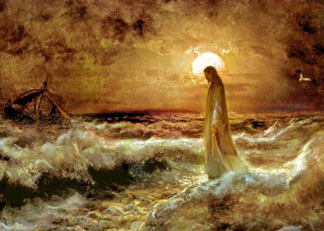 Salvation And Survival: "Calm The Storms, Father!" If there is one positive side effect from the forces of nature, it is that it shows both the best and worst of humanity. But since the best of us comes from God, and the worst from the Enemy, I refuse to glorify our adversary's deeds. Instead, I want to share the wonderful presence of the Lord that I have witnessed, as we here in South Texas face a devastating hurricane. I love it that all the walls we put up between us come down when we face a mutually challenging and terrifying situation. As Mark and I stood in long lines at the grocery store for water and nonperishable food, and at Lowe's where people were buying generators, batteries, and plywood, I was encouraged by the courtesies displayed and genuine concern shown for each other. "Stay safe" was spoken to complete strangers, and people were willing to help each other and offer advice. Perhaps we each identified with our common mortality and just wanted to make a connection when confronted with our vulnerability. Whatever, the reason, I loved seeing the compassion and mercy. But it was the connections between my Brothers and Sisters in Christ that has been so inspiring. Mark and I have received so many texts and phone calls [from all across the country] letting us know that people are praying for us. And we have met privately with other families to spend time in prayer, revealing our requests and needs to our loving Father. For me, I find great strength in His promises ... the Name of the Lord is a strong tower. The righteous run into it and are safe. In the spirit, I picture each of our families snug and warm inside of a stone tower, sitting by a warm fire with Jesus, oblivious to the storm that rages outside. I also declare that my community is the Land of Goshen, which is the segment of land that Joseph bequeathed to the Israelites during his reign in Egypt. 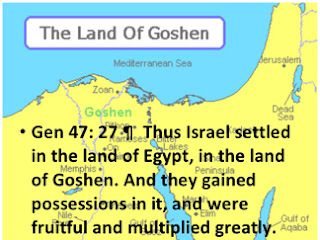 They lived in the land of Goshen until the time of Moses, when Pharaoh refused to let them go so they could worship God freely. So God sent ten plagues of destruction, darkness, chaos and death. But these plagues did not occur in Goshen. God protected the Israelites in the land of Goshen through the blood of the Lamb over their doorposts, as a mark of faith. So I appropriate the same blood of Jesus over this community of believers, of which we are a part. I declare that our lives, families, and households are protected, and we live in the land of Goshen where no destruction, darkness, chaos or death will occur, in Jesus's Name. I also declare the promises of Psalm 91 which says if we abide in God and dwell in the shelter of the Most High, we will remain secure and safe, and rest in the shadow of the Almighty. He will be our refuge and no disaster will come near our tents, for He will command His angels in regard to us, protecting and defending and guarding us. He will set us on high because we know His Name and we have set our love upon Him, trusting and relying on Him, knowing He will never abandon us. And I find great confidence in knowing God and Jesus are the Creator of the winds, and the rain, and the seas. Just as Jesus calmed the Sea of Galilee, He can do the same in regards to Harvey. We have asked God to use the storm to water our drought-stricken land, which testifies to His goodness. But we cancel any assignment by the Enemy to corrupt what God has created or to send devastating storms against us. In the end, we only have each other and God to rely on. After we come out on the other side of this, I have a feeling we won't be concerned about all our "stuff", but will be praising Him for His faithfulness and trustworthiness; for His never-ending covenant with us and His steadfast love. This storm, too, shall pass, but His Word will never pass away. And so, we cling to Him in the midst of uncertainty and the force of nature. But I am left with this final promise ... My soul clings to You; Your right hand upholds me. So, I face this storm with unswerving faith, knowing Who has me in His hand. And there is no room for fear. NOTE: Again, I have no idea if we will lose power, or when I will be able to post again. If I can, I will let you know how we are progressing through the duration of Hurricane Harvey. Any and all prayers are appreciated! Jeremiah 10:13 When He utters His voice, there is a tumult of waters in the heavens, and He causes the clouds and the mist to ascend from the end of the earth; He makes lightning for the rain, and brings out the wind from His treasuries and from His storehouses. Yes! Father, as we enjoy the eye of the storm (literally), I praise you for setting us in Your land of Goshen, and I thank you that we have emerged from this first stage of the storm unscathed and free of trauma and destruction. You are Faithful, and Your Word is true! Praying for you and your husband. May God bless and protect you. Thank you, Lisa! We are fine and no damage. Please send prayers to all those in Houston area. They are hurting!